This was a man who enjoyed the simple things in life. He found his place in the great outdoors, hunting, fishing, 4 wheeling, boating, barbecuing, spending time back country at the camps, and most of all having friends over for cold beers in the garage while watching the Detroit Red Wings. He and his buddies always got together at a pub called the Fox and Hound, and they always sat at what they called the Liar’s Table, where they told stories about their day. One can imagine the table earned its nickname because of some exaggerated truths. In Christianity, the table is the ultimate symbol where grace and fear meet; where divinity and humanity break bread and drink from a cup. Some would argue that the table may be the most poignant symbol because it was at table where Jesus gathered his friends one last time. It’s a profound thing to be gathered with friends (and not yet friends) around a meal. When Tim Horton’s found out he died, they sent their loyal customer’s family some flowers. 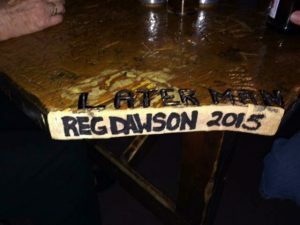 When the Fox and Hound Pub found out, they cut off the corner of the Liar’s Table and had it placed in the casket with Reg, so that he’d always have a place at the table. For pubs who understand ‘community’ better than most churches, I give thanks to the Lord. Love hearing this story, miss our dear Reg.